Exeter City goalkeeper Christy Pym and midfielder Matt Grimes have been picked for the England Under-20s squad to face Romania on 5 September. Pym, 19, has been an ever-present in the Exeter first team since the middle of April and has played 14 games. Grimes, 19, was voted the club's Player of the Year last season. The highly rated Grimes, who has also started every match so far this campaign, has been linked with a move to a Premier League club, but while Pym at St James Park in May. 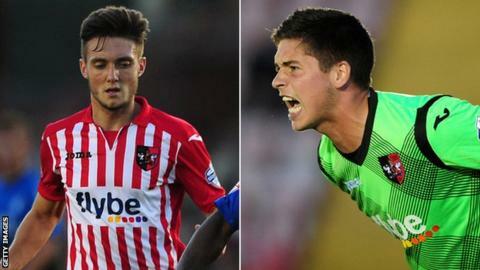 It is the first time Exeter have had players called up for an England age-group team. Aidy Boothroyd's squad will get together at St George's Park on Sunday, 31 August with the match taking place at New Bucks Head, the home of AFC Telford.